This product contains color crystal for easier application and won't stain carpets or floors. It utilizes an exclusive blending process, not just a simple blend and melts down to 0Â° F. It also won't harden or clump when stored properly and provides unlimited shelf life. 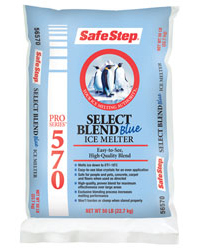 A quality and consistent melt for long walkways or large surfaces. Even better, it won't harm skin or pets' paws.